Bringing art into everyday life , the tagline says it all. 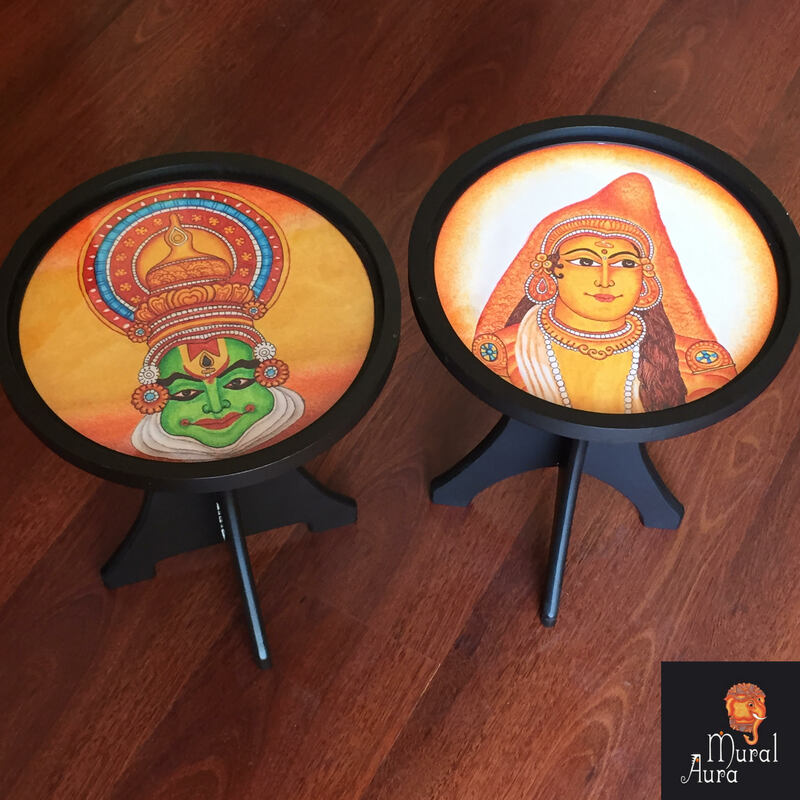 Mural Aura home decor products carry a distinct style of the Kerala mural art , a rich tradition of painting dating back to the 9th century CE when the art was patronised by the royalty on walls of temples and palaces. Click here to read more about the beauty of the art form from my earlier post. Mural Aura and many others from the current generation of artists have made access of this art form to the common man easier by making it affordable , in keeping with the times and preserving the art form at the same time. In the past , it was a privilege enjoyed by the royalty or the nobility only. Mural Aura seems to have redefined the meaning of buddy stools ! Buddy stools are no longer a synonym for seating stools , you can now place them anywhere in any of your rooms as side-tables , a companion to seaters , a buddy to the seaters ! Google buddy stools and find Mural Aura. Simple sofa seaters with a buddy stool for demonstration. 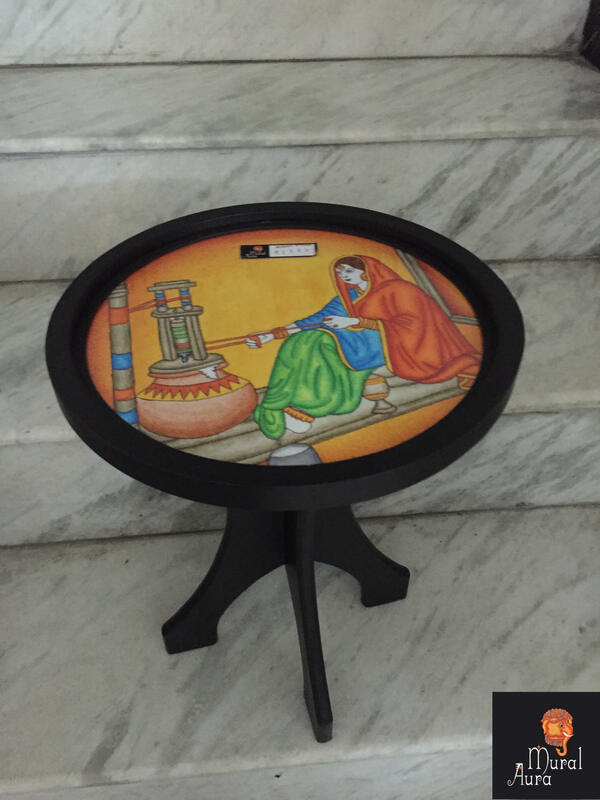 The buddy stool in the picture above , and in the one below , carries an image that is the artist’s imagination in bringing together the male and the female energies by juxtaposing the two faces , the green for male and orange for female. Buying this in a pair makes sense – if the above picture is that of conjoining male and female energies , the following one illustrates the two images as two entities , yet complimenting each other. Kathakali faces with male and female attire. Kathakali is yet another traditional art form that originated in Kerala , this time a form of dance and the tenets laid down for the art allow for only male dancers. But just like every other art is subject to metamorphosis in the passage of time , so has this one and female dancers are gaining acceptance. We now move a tad away from the typical Kerala mural art subjects and work on a folk theme , that of a Rajasthani woman , churning butter. Rajasthan is India’s largest state by area and borders the northwest part of the country. Material : Carved from MDF – medium density fibreboard and softwood , they are given a base protective coat and painted. The picture is encased within a 1 mm glass and secured by a fibre ring with adhesive , making it safe and sturdy. The picture within is a digital reprint on canvas , from a high resolution scan of the original painting. Dimensions : 16″ in height & 12″ in diameter. 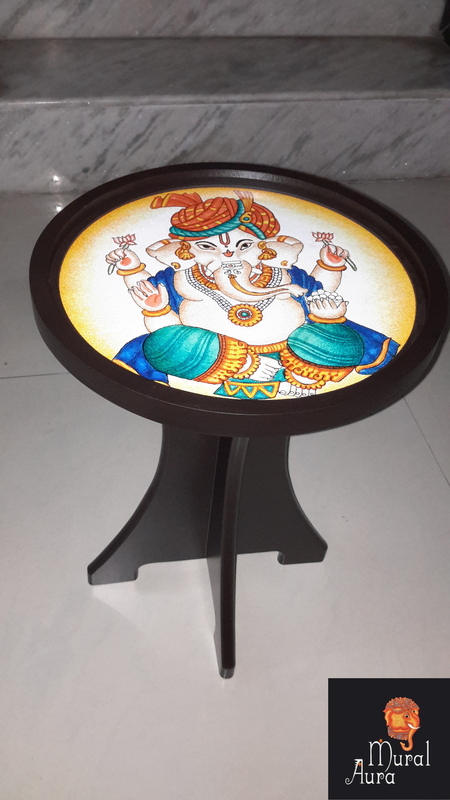 The buddy stools can be customised , can contain an original handpainted mural for a corresponding price. Great idea to buy a few buddy stools for a home. True to their nomenclature , move them around to change the decor of the rooms. Pair them , create a theme or just play around. Mural Aura’s buddy stools are home-decor-buddies.